What Is It About Week 6? After an unexpected and exciting start to the season, the Wildcats had found themselves in the top 15 of the AP poll and in discussions as a dark horse for the College Football Playoff. The Wildcat faithful were riding high, the B1G West was looking soft, and we we’re thinking surely this could be a special season. But what is it about Week 6 that seems to take the wind our of sails? In seasons past it has made us go from dreams of Big Ten Titles to big time empty bowl stadiums somewhere in Texas. It’s taken us from hopes of rebuilding to hopes of the season being over. Since 2008, Northwestern is 1-7 in its sixth game of the season. The lone win comes in 2009, against an abysmal Miami (OH) team which finished 1-11 (and the ‘Cats squeaked out a sloppy 16-6 win). While this wasn’t totally unexpected or devastating, our shot at a Big Ten Championship essentially vanished. Believe it or not, had the ‘Cats won that game (and managed to not lose to an awful Indiana team) NU would have tied for a share of the B1G title. This one really stung. 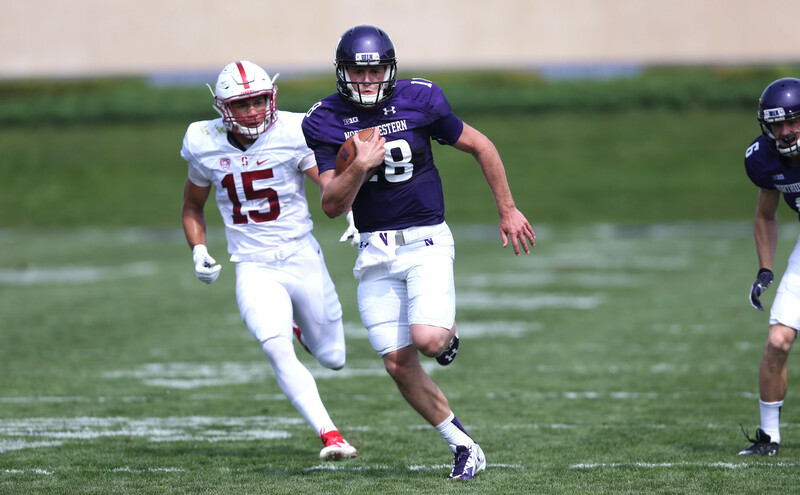 Northwestern was 5-0, riding high after a huge 29-28 win at Minnesota the week before. Aspirations of a B1G Title were beginning to brew and a win over Purdue seemed almost assured (Purdue went 4-8 that season). Instead, the Wildcats looked terrible and missed a last second field goal which could have sent this one to overtime. Makes you wonder what could have happened that year if we pull this one out (and Persa doesn’t get hurt against Iowa). Yet again, the Wildcats remained undefeated after 5 weeks. We headed to Happy Valley with a chance to prove we were for real and came up short. NU blew a 28-17 4th quarter lead by allowing 22 unanswered by the Nittany Lions, and yet again hearts were crushed. A week after what appeared to be the biggest game in recent memory, the Wildcats headed to Wisconsin with hopes to bounce back and continue its quest for a Rose Bowl birth. Instead, NU got completely waxed by a good Wisconsin team and this loss set the tone for the rest of the season (NU finished 5-7 and missed a bowl game for the first time since 2007). The start of the 2014 season was a fairly disastrous one, and after loses to Cal and Northern Illinois most people had written this team off. However, the ‘Cats came back and won back-to-back B1G games against Penn State and Wisconsin and people started thinking maybe this team had done some serious growing up in the past few weeks. However, a kickoff return right after NU tied the game at 17-17 in the fourth quarter cost the ‘Cats, and broke our hearts yet again. You guys all know what happened here, so I wont rehash it. Long story short – it looks like its time to start bringing back a Miami (OH) for Week 6. Let’s at least let our dreams remain intact going into the second half of the season. But enough about Week 6 – let’s beat Iowa next week, and hopefully start to bring back hope of a B1G West Title. Congrats on a real nice season so far! Helluva win against Stanford. Nice guts last week to pull that one out in Durham. Way to go 1-0 each week, amirite? Not to nit pick, but just thought I’d shoot you a note with a quick suggestion. Take it or leave it – up to you – but as a friend, wanted to give you some bud-to-bud advice. First off – great job on recruiting this Justin Jackson fellow. Man, that kid can really run. Hard to believe that as a true freshman he put up a 1,000 yard season last year. Even harder to believe that you refused to start him until several games into the season, but whatevs, it’s cool. Not like he could have really helped us in those home losses against Cal and NIU. I know you’re not a big fan of stats, so let me do that math for you. Justin’s had 85 carries so far, or an average of more than 28 per game. That’s insane, dude. Watching the Duke game (35 rushes for JJ), I could tell he was wearing down. You know you have other running backs on the team, right? And they’re not too shabby either – may I remind you that Solomon Vault and Warren Long scored our only two touchdowns against Duke. Outside of the Eastern Illinois game this year, those two only have 17 total carries. Not telling you to how to do your job or anything, but maybe consider giving them the ball a bit more? It’s a deep position for the ‘Cats, so let’s spread the wealth. Just, ya know, a bit concerned that JJ is going to get hurt carrying the ball 28 times a game. And since running the ball seems to be our only way to move on offense, maybe we try and avoid an injury to our best player on that side of the ball. Again, just a suggestion – take it or leave it. And hey – if this is more of a McCall question, just let me know. Happy to reach out, as I’ve got a lot to talk to that guy about. Northwestern has crept into both the AP and Coaches polls after a solid Week 2 performance against FCS foe Eastern Illinois. While most NU fans are excited by this news, yours truly couldn’t be more upset. NU has a huge challenge ahead of them next week on the road at Duke, and now that both the members of the media and head coaches have chosen us worthy of their top-25 lists, we’re almost assuredly going to lose. Why, you ask? Well let’s take a look at all games during the Fitz era where NU first entered the polls. Other than the season opener in 2013 where Collin Ellis put the team on his back, NU has lost every single game after debuting in the polls. You could even argue that they didn’t technically debut in the polls at Cal since they finished the 2012 season ranked in the final polls. Let me just say – this trend is frightening. The only games NU has won as a ranked team during the Fitz era all came in 2013 (@Cal, Syracuse, Western Michigan, and Maine), arguably the most disappointing season in Northwestern football history. Is the coaching to blame? Was it just the luck of the schedule? It’s tough to say. Don’t get me wrong – I’m as excited as you are that the ‘Cats are 2-0. I just wish we could have stayed out of the polls for at least another week. It feels pretty darn good to be 1-0. The ‘Cats shocked the #21 Stanford Cardinal on Saturday 16-6 behind a dominant defensive performance. The youth on the team showed what it could do, and with a very manageable schedule for the rest of 2015, the future looks bright. After watching a replay of the game, here are five observations from the huge opening win. Anthony Walker is a star. The redshirt sophomore was all over the field on Saturday. Dropping back in coverage, blitzing, playing spy on the QB, defending the run. No matter which, he pretty much always made the right play. He was constantly in the passing lane – if he can develop a pair of hands to pick off more throws, then watch out. Walker almost seemed like he knew what the offensive play was going to be before the ball is snapped. His anticipation and instincts are great, and he will be a joy to watch the next few years. I thought he was the best player on the field against Stanford. Our offensive and defensive lines outplayed the Cardinal. We won this game in the trenches, plain and simple. Since line play was supposed to be Stanford’s calling card, this was hugely encouraging. 225 yards rushing for the ‘Cats, and 85 for the Cardinal – enough said. Clayton Thorson was clutch. Of his 12 completions in the game, seven went for third down conversions. His cross-the-field bomb to Shuler late in the fourth was a huge throw at a huge time, and helped us seal it. To be fair, he had some fluttering throws that almost looked Tebow-esque, and a few boneheaded decisions that looked Cutler-esque. Luckily the Stanford secondary had almost as bad a case of the dropsies as the Stanford wide receivers on Saturday. So yea, maybe he got a little bit lucky, but the point is he came through when it mattered…and we won. He played within himself, managed the game, and delivered in crunch time. Not bad for a 19 year old making his first career start. The defense didn’t miss a tackle. OK they probably did at some point, but I didn’t notice any missed tackles when watching the replay. The entire defense swarms to the ball as the play develops, and once they get there they make sure it stops. There were several huge open field tackles by Walker, Henry and Lowry that stood out. This D has attitude, talent and speed – they will keep us in games this year. We might be pretty good. The ‘Cats came into this game with low expectations for the year (at least from fans and media), but this win turns it all on its head. We just beat the best team on our schedule, and did so in decisive fashion. Yes, Stanford was sloppy and had some big drops that could have flipped the momentum, but all in all we looked the better team. What’s most encouraging is that we have an identity – we’ll run the ball down your throat, play suffocating defense and not make mistakes. Clayton Thorson and JJ together in the backfield is very tough to defend. While Thorson may not be as shifty or agile as former QBs like Kain Colter, he has more downhill speed. Once he gets going, he can hit another gear – I loved to see him actually pulling away from the Stanford secondary on his TD run. He may have made a few tough decisions on Saturday, but that part of his game will only improve with more experience under center. He’s going to keep getting better, and guess what – so are the rest of the ‘Cats.